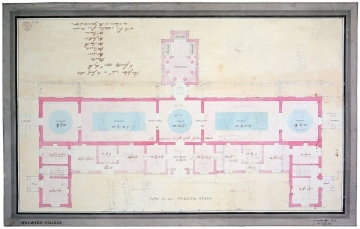 The main difference between these two plans and the previous plan, drawing 28, is that the end bays of the almshouse extending to the west are wider and they are two storeys high, as can be seen by the addition of a staircase. The gallery rooms are a sequence of cubes and double cubes. Waterfield states 'the carefully proportioned shape... follows the Palladian tradition in British architecure' (Soane and After: The Architecture of Dulwich Picture Gallery, 1987, pp. 13). It is a symmetrical layout with the five central bays and projecting end bays on either side. Drawing 29 includes two parallel entrances into porches for the almshouses, previously illustrated in the elevation of drawing 27. 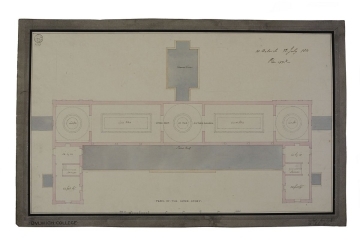 The plan of drawing 29 shows that as domestic spaces the almshouses are to be heated by fireplaces, as indicated by the niches in the wall. Whereas the Gallery was to be heated by a central steam heating system shown by flues embedded within the wall. The dimensions of the Galleries were clearly discussed during the meeting judging by all the corrections made on drawing 29 in pencil. The dimensions written in ink are 18 feet by 22 feet, 40 feet by 21.9 feet, 20 feet by 6 inches square. These were crossed out in pencil and replaced with the two large galleries marked 40 feet by 20 feet and the middle and end galleries marked 20 feet by 9 inches square. These revised dimensions correspond exactly with those built. The optimum length is also adjusted from 144. 6 feet to 148.3 feet with an addition of 3.9 feet making the length 152 feet, which is just two feet short of the length of the Gallery built. The plans are drawn from a different angle than the previous designs. All of the other drawings have been drawn as if viewed from College Road, whereas the Gallery is now drawn as if seen from Gallery Road. So north is to the left of the drawing rather than to the right.